13-year old Hallie Gordon leaned against the sturdy pasture fence and watched the bay thoroughbred gelding graze peacefully in the warm morning sun. "Dash, come here boy." She called softly. He whuffled a soft nicker and started towards her. "Want to go for ride?" She asked as she slipped a white halter over Dash's head. She led him from the pasture and up into a small but nice barn not far from the pasture. After putting him on the single set of cross-ties, she gave him a thorough grooming while talking to him softly. After Dash's coat shone like gold, Hallie placed the saddle pad and saddle on his back. Then she tightened his girth and bridled him. "Let's go riding." She said patting his sleek neck as she led him from the barn. Dash wasn't Hallie's horse but she liked to think of him that way. Her neighbors had owned him for years and when she moved in next door over a year ago she had been spending time with him and her neighbors allowed her to ride him anytime she liked. Hallie lengthened her stirrups and mounted onto Dash's tall 16 hand back. 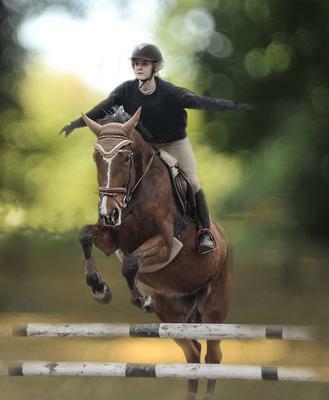 She urged him to a walk and started towards the empty pasture where she had set up a jump course. After a couple minutes, she squeezed him to a trot and began rising with every other beat. "Good boy!" She said a little bit later as she set him up for the canter. He broke into it smoothy.She cantered 2 circles and turned him towards a cross rail set at 18 inches. She gracefully went into two-point as Dash popped over the jump. Hallie turned him towards a 2-foot vertical. Two strides away from the jump a car door slammed. Dash spooked and ducked his shoulder sending Hallie into the dust. Out of instinct, Hallie quickly grabbed Dash's reins and looked across the yard. A girl about Hallie's age stood in white breeches ,a white polo, shiny black tall boots and her golden blond hair slicked back into a french braid. Hallie stood up, brushed herself off and mounted back up. "Hallie?" She turned around to see Mrs. Johnson, her neighbor, by the fence. "I want you to meet my niece, Jessica." She pointed to the girl who had slammed the door. "She is an elite rider and is going to be riding Dash also." Hallie's heart dropped. She had always been the one who rode Dash. She came out almost everyday, even if she didn't ride. This was not going to be easy. Comment and let me know if you want more! This is so cool, Heratbeat For Horses! Great story so far! Please write more! It's so good! Please keep writing!